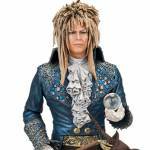 At the McFarlane Toys Booth for Toy Fair 2017, we were treated to our first look at an all-new Labyrinth Jareth: The Goblin King Figure coming to the Color Tops Collection. We now have some new info and a new official image for the upcoming 7″ scale figure. 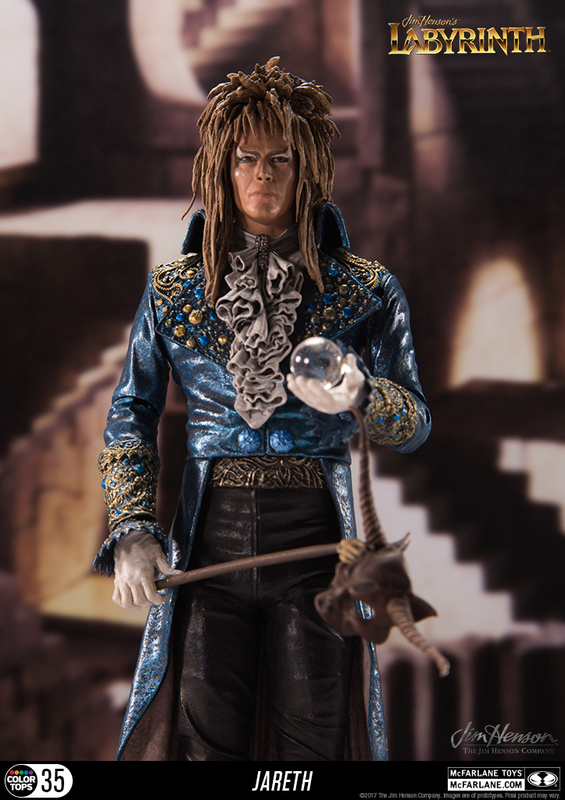 Jareth will include a masquerade mask and a glass orb as well as 12+ points of articulation. 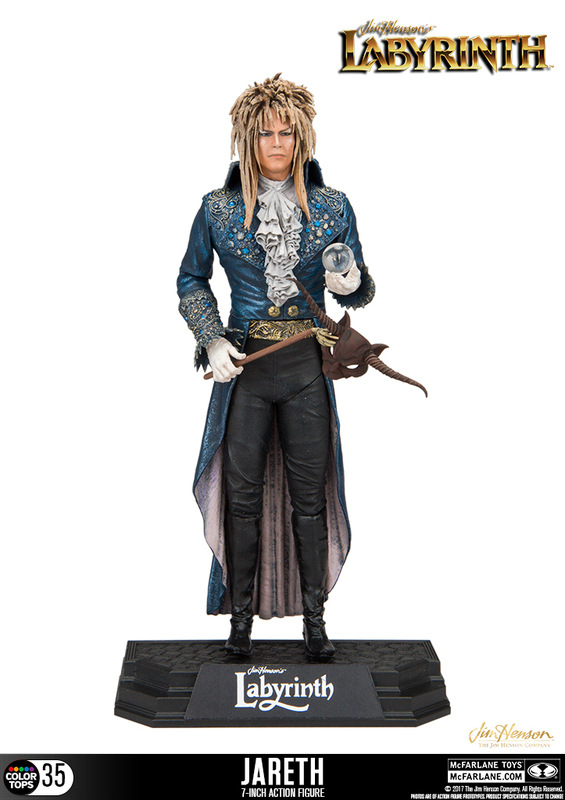 Look for the Labyrinth Jareth: The Goblin King Figure to hit stores in October. He will be priced at $19.99. Click the thumbnail image for a better look at the figure. Hell yah. I hope we get jennifer connelly too. I like the tooling, the details great. And I like some of the license they're getting but these are glorified statues. I really wish Mcfarlane was doing leg articulation and more accessories and things. I feel like this is a big step backwards for them. Was super excited to see them get the Destiny license but I don't really want a statue. Figures they made 20 years ago had more articulation. But for those who like these they must be pretty excited. Wonder if their Walking Dead "figures" are selling well, I stopped getting them after they switched to this scale/style. But the fact that Jareth is in his masquerade garb, means that if we do get a Sarah, we'd get the masquerade Sarah in the dress, I much prefer the "regular" Sarah. Doesn't matter, as long as the headsculpt looks like Jennifer Connelly, that's the most important! He looks better than I thought he would. I'll get him for sure. And I like some of the license they're getting but these are glorified statues. Sadly that's not going to change any time soon. Shartimus Prime recently did a super cringeworthy interview with McFarlane and asked him about the statue-figure situation. It sounds like McFarlane is determined to dig his feet in the ground and continue to set the industry back as far as advancements in articulation are concerned. It's really a shame considering that his company did a lot of solid work in the 90's to set the stage for the standards we're used to nowadays. All that said, I'll definitely pick this figure up. I missed the NECA one several years back and I think I can learn to like the pose for this statue. I don't see how he can possibly set the industry back. It is so very, very unlikely that any other company is going to follow suit. If he wants to aim more towards aesthetics, I say more power to him. I don't need my figures to be able to auto-fellate. I don't need my figures to be able to auto-fellate. That interview was over a year ago before McFarlane made the decision to put more articulation into his scuplts. He's going from 5 to 7 points to 14 to 16 points in each figure. Depending on the license. This fall well see changes. Those thigh cuts are not supposed to add any useful articulation, are they? Looks almost as if they threw that in simply to justify the name "action figure". Silly, that's just to let out the steam from Bowie's crotch. Shartimus Prime is a retard. He's like the Guy Fieri of toys. That's the truth! Sadly, he's one of the better youtube toy reviewers at the moment and (in regards to this particular figure/thread) I think he was the only reviewer who got a good chance to talk with McFarlane in depth. I think McFarlane wanted everyone to know that he can't really hold the mask to his face, the articulation on his arms won't allow that. I highly disagree, I think Anthony's Customs is the most critical toy reviewer I have seen so far. Matthew Brando is also good, though he doesn't review a lot of toys, unfortunately. I also like Jobby the Hong (Swivel here! ), even though he is more entertaining and VERY funny, he does good reviews and was one the few reviewrs call out on DC Collectibles awful Batman Animated line. Shartimus is Hasbro's pawn, in general most bigger known toy reviewers are bought by one toy company or more (e.g.Pixel Dan). Not that I'm an expert or anything, but I've never heard of any of those guys save Anthony's Customs, so I'll definitely check them out. Glenn Webb was also pretty good, but sadly he passed away a little while back. There's literally dozens and dozens of guys on YouTube reviewing toys these days, so there's a near-limitless number of options available so people don't have to subject themselves to dildos like Shartimus. I think Anthony's Customs is the most critical toy reviewer I have seen so far. I agree, Anthony's Customs is very good. I also dig "From The Shelves" as well. Is it just me, or does there look like some trickery going on when Jareth is holding the mask to his face? As in, you won't really be able to pose him in that position, but they made the pictures look like you can. The first one (close up) looks like they used perspective to make make it look like the mask is up against his face. The second looks like photoshop. A Hot Toys Jareth and Hoggle would be glorious lol.